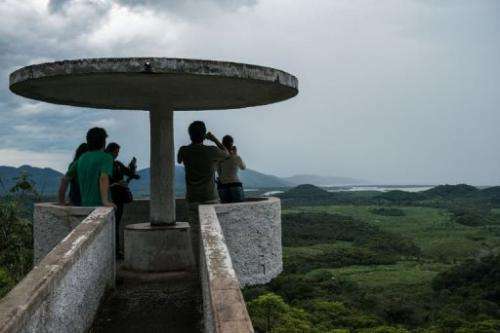 People look at part of the Atlantic rainforest near Salto Morato Nature Reserve, in Guaraquecaba, in the southern state of Parana, Brazil, on October 23, 2012. 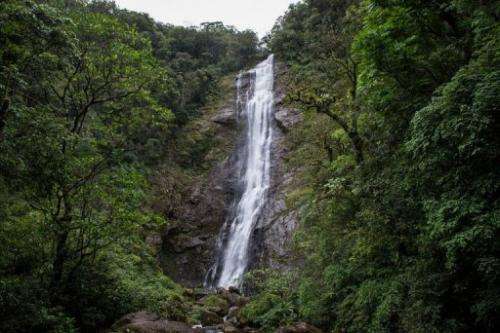 Salto Morato, a 2,253-hectare nature reserve, was set up by Brazilian cosmetic giant Boticario's foundation in 1994. Brazil's Salto Morato Nature Preserve is a haven for scientists studying the dwindling Atlantic rainforest, an area less renowned than the Amazon forest but just as biologically diverse and equally threatened by human encroachment. The preserve in Guaraquecaba, in the southeastern state of Parana, covers a corner of what was once a huge littoral rainforest known as the Mata Atlantica. The Mata covered 1.3-million square kilometers, or about a quarter the size of the Amazon rainforest, when Portuguese colonizers arrived in the 16th century. Today less 10 percent of it remains, the result of deforestation for agriculture and relentless urban sprawl. Sixty-two percent of Brazil's 194-million-strong population live in the region, including in major cities like Sao Paulo and Rio. What is left extends in fragments along Brazil's coast. Less than two percent of it is under strict protected status. 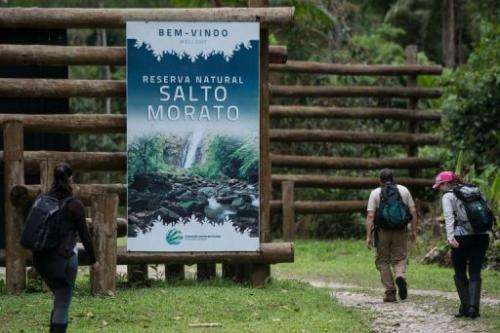 Salto Morato, founded in 1994 by a foundation set up by Brazilian cosmetic giant Boticario, is home to around 2,200 species of birds, mammals, reptiles and amphibians—60 percent of all of Brazil's threatened animal species. The nature preserve, which opened to the public in 1996, is part of a mosaic of public and private "conservation units" set up to preserve what is left of the forest. "In order to preserve you need to know," reserve administrator Eros Amaral Ferreira said. Boticario-funded scientists are literally having a field day as they conduct research in this 2,253-hectare (5,567-acre) biodiversity paradise. Marcelo Silva, a biologist from the Pontifical University of Parana, studies the reproduction and pollination of the bromelia, an exotic plant characterized by flowers with a deeply cleft calyx. "Bromelias reproduce either sexually or asexually and they provide the nectar that humming birds use to pollinate other plants. So they play a vital role," Amaral Ferreira told AFP. "Unfortunately, many people come here to pick them in an unsustainable and destructive way." Trekkers arrive at Salto Morato Nature Reserve, in Guaraquecaba, in the southern state of Parana, Brazil, on October 23, 2012. Salto Morato, a 2,253-hectare nature reserve, was set up by Brazilian cosmetic giant Boticario's foundation in 1994. The 25 protected areas of the Atlantic Forest South-East Reserves were declared as World Heritage site by UNESCO in 1999. Ubiquitous in the lush, humid reserve are various species of palm and banana trees as well as the red and yellow heliconia, a close relative of gingers, bananas, and birds-of-paradise. Singing birds are also in abundance, much to the delight of Ricardo Pamplona Campos, an ornithologist from the Federal University of Parana. With funding from the Boticario Foundation, Pamplona Campos has been studying for nearly two years the interaction between plants and fruit-eating birds, as well as the impact of forest degradation on local bird species. On a recent morning tour of the reserve, the ornithologist showed off his intimate knowledge of various singing species, including the rufous-capped motmot, the sabia—the national bird of Brazil—and the flame-crested Tanager. There are 324 different bird species on the nature preserve, including nearly 200 bird species found only in Brazil. There are also 43 species of frogs, 55 of fish, 36 of reptiles and 58 of mammals. Salto Morato researchers have even discovered two new fish species and a previously unknown species of three-fingered frog. Amaral Ferreira said surveillance cameras have established the presence of at least three pumas on the reserve. One of his major headaches is the widespread and illegal harvesting of wild palmitos inside the reserve, which results in the death of palm tree, as well illegal hunting and poaching. Species most threatened by either hunting or loss of habitat include the ocelot, the white-lipped pecari, the armadillo, the puma and the black-fronted piping-guan, a bird noted for its large red throat wattle and large white patch on the wing-coverts. Amaral Ferreira said his staff of 10 is too small to monitor trails, conduct surveillance and deal with the 5,000-plus visitors, including campers, that come each year. "I need at last four more people," he said. He sees great potential for a growth in ecotourism at the site, but said this would require a major investment to upgrade access roads, increase surveillance and open more trails. The nature preserve, which runs educational programs in partnership with local schools and an environment police unit, has a visitors center, a research center, a training facility and a weather station. Hailed as a model in nature reserve management, Salto Morato was named a World Heritage site by UNESCO in 1999.